The first menu youll see at Calico Cat Cafe in Tokyo has nothing to do with food: its the cat selection. But you wont be dining on any of these adorable felines theyre just there to provide some companionship while you sip a cup of tea. The watchful staff ensures that guests treat the cats respectfully, and provide complimentary bags of dried cat food that can be used to attract your desired playmate. For many Tokyo residents, owning a cat isnt realistic, so the citys 30-odd cat cafes give them a chance to enjoy some commitment-free cat stroking. 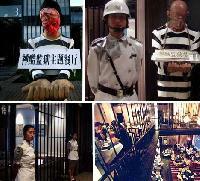 The owner of the Devil Island restaurants in China reportedly wanted to scare people away from a life of crime by showing them just how rough prison life can be through a jail-themed restaurant where youre led to your table in handcuffs and served fried coffin-shaped bread. Each table is surrounded by rusting prison bars, and youre served by waiters in black-and-white striped uniforms. A similar restaurant in Beijing is misleadingly named Zen Cool. Almost everything at the restaurant is sculpted out of ice. 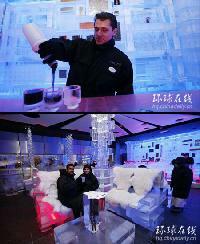 Diners will sit on ice benches or chairs, eat at ice tables, out of ice plates, drink from ice glasses served from a bar made of ice.the restaurant is Dubai-based Sharaf Groups enterprise while technical inputs came from Canada-based Iceculture Inc, who are credited with building ice lounges around the world. Mmm, airplane food. If you just cant get enough of eating on airplanes but youre sick of going through security and paying expensive airfare to do it, you may want to visit the A380 In-Flight Kitchen in Taipei. The restaurant resembles the inside of a plane, with faux oval-shaped windows, baggage compartments and speckled blue seats complete with headrests. Waitresses dress like flight attendants, and passengers have much more than just chicken or fish to choose from. Beautiful underwater restaurant secured 5 metres below sea level at the Hilton Maldives Resort & Spa in Rangalifinolhu, Maldives. The restaurant has a capacity of 14 people and is encased in transparent acrylic roof offering 270 panoramic view to its customers. Not everyone can stomach eating a meal while dangling 150 feet above the ground from a crane, even if youre not usually afraid of heights. 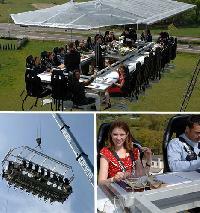 At Dinner in the Sky in Belgium, diners are strapped into chairs, raised to half the height of Big Ben and served meals like ham salad and sauteed prawns that are cooked in a small oven in the center of the structure. Taipei is known for its variety of strangely themed dining establishments, but this one might just take the cake. Your surreal experience starts with the name, D.S. Music Restaurant, which in no way hints at whats actually inside. Wait staff dressed in nurse uniforms push you to your table in wheelchairs, where your drinks are served from an IV-like contraption hanging from the ceiling. The nurses ask trivia questions, and if you get them right, youre rewarded with shots of a tasty drink squirted into your mouth with a syringe. It only gets a stranger from there. Once youre done eating, a female staff member in a deranged ballerina costume dances on your table. The food called as Nyotaimori, means female body plate is one of the weird and unique food from a Japanese restaurant. The restaurant serves Japanese food sushi and sashimi inside a womans body. The body is made from food and placed on a table looks like surgery table in hospital. Customers can eat any part of the body. The unique part is when we cut the body, it will look like bleeding just like human body, ouchh. 06. How can you make your own compass?